Background: Docetaxel (DTX) has been used to treat several types of cancers, but it has provided pharmaceutical challenges due to its poor water solubility and toxicities associated with the co-solvents (tween-80 and ethanol). Nanopolymer therapeutics can be engineered to deliver anticancer agent specifically to cancer cells, thereby leaving normal healthy cells unaffected by toxic drugs such as DTX. The objective of the present study was to synthesize the polyacrylic acid (PAA)-DTX conjugate (PAADC) and preparation of nanopolymer therapeutics such as PAADC/DSPE-mPEG2000 mixed micelles (PAADC-DP MMs). Methods: The prepared PAADC-DP MMs were characterized for mean particle size and zeta potential, in vitro release profile using dialysis technique, hemolytic behavior against human blood, and cytotoxicity against human cancer cell line (A549) using MTT assay. In vivo acute toxicity of PAADC-DP MMs was determined in albino mice at intravenous single dose of 40 mg/kg. Results: PAADC-DP MMs showed mean particle size of 443±9nm. PAADC-DP MMs showed maximum DTX loading (DTX equivalent; 90.5±2.7%) with minimum DSPE-mPEG2000 molecules (1:1 ratio), while to load 77.9±2.2% of plain DTX, more DSPE-mPEG2000 is required(1:10 ratio). The developed PAADC-DP MMs system showed significantly lower CMC (5 ng/mL), sustained release profile (28.6±1.9% after 48 h of study), lower hemolytic behavior (13.7±1.3% of hemolysis ratio at 40 µg/mL concentration and after 1 h incubation), higher in vitro cytotoxicity (IC50 of 0.0064±0.001 nM after 48 h study) and remarkably reduced in vivo toxicity (9.9±2.1% body weight loss) in mice when compared to marketed Taxotere®. Conclusion: The obtained results clearly demonstrated that the developed PAADC-DP MMs system is a promising approach for cancer chemotherapy with reduced toxicity. Keywords: Docetaxel, in vitro hemolysis, in vivo acute toxicity, mixed micelles, MTT assay, polyacrylic acid. Keywords:Docetaxel, in vitro hemolysis, in vivo acute toxicity, mixed micelles, MTT assay, polyacrylic acid. Abstract:Background: Docetaxel (DTX) has been used to treat several types of cancers, but it has provided pharmaceutical challenges due to its poor water solubility and toxicities associated with the co-solvents (tween-80 and ethanol). Nanopolymer therapeutics can be engineered to deliver anticancer agent specifically to cancer cells, thereby leaving normal healthy cells unaffected by toxic drugs such as DTX. 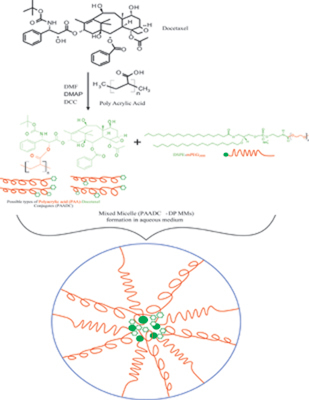 The objective of the present study was to synthesize the polyacrylic acid (PAA)-DTX conjugate (PAADC) and preparation of nanopolymer therapeutics such as PAADC/DSPE-mPEG2000 mixed micelles (PAADC-DP MMs).